Who is the oldest ruler whose remains can be positively identified? I realize this question can be quite controversial since "positive identification" is rather subjective especially with regards to ancient history. Regardless, I am curious to know which ancient rulers historians are fairly confident we can identify remains for. My first guess would be one of the early Egyptian pharaohs, perhaps Narmer? The tomb was lined and sealed with pink granite. It contained parts of a pink sarcophagus, alabaster Canopic jars, alabaster offering containers and the remnants of a mummy. Upon investigation, archaeologists believe the mummy to be that of King Neferefre. He was probably between 20 to 23 years old at the time of death. Wikipedia, citing Strouhal & Vyhnánek (2000), states Neferefre is "one of the very few Old Kingdom pharaohs whose mummy has been identified." Next oldest ruler with identified remains is Djedkare Isesi, also of the 5th dynasty, who died around 2375 BC. 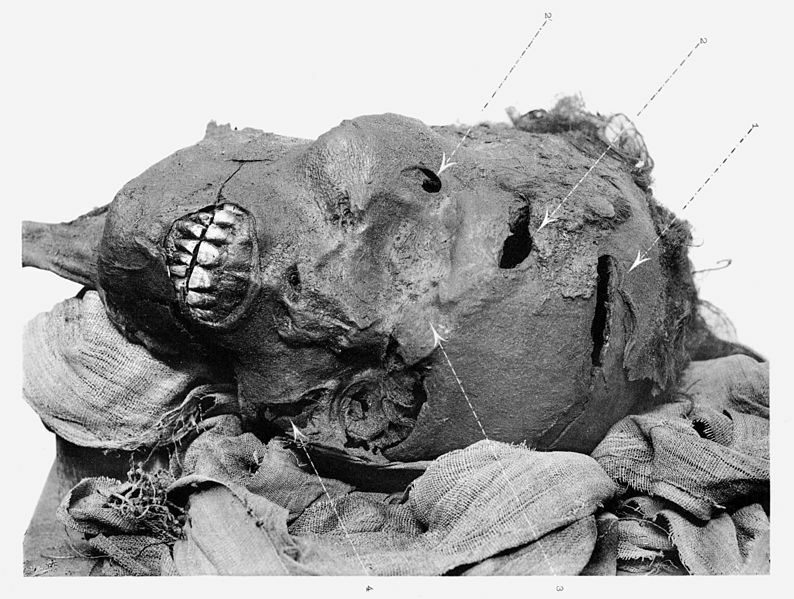 As with Neferefre, we can't be 100% sure about the identification: "the mummy currently thought to be Djedkare's suggests he was about 50 when he died." The oldest remains of a ruler (positively identified) which are on display is the mummy Seqenenre Tao (or Tao II), 14th Pharaoh of the Theban dynasty (Egypt) during the Second Intermediate period. We have some details of his (gruesome) death, but the date is uncertain: he is believed to have started ruling around 1560 BC (or a bit later). This source gives the dates 1558 - 1554 BC. "Mummified head of Seqenenre depicting his battlewounds" The mummy can be seen in the Egyptian Museum in Cairo. 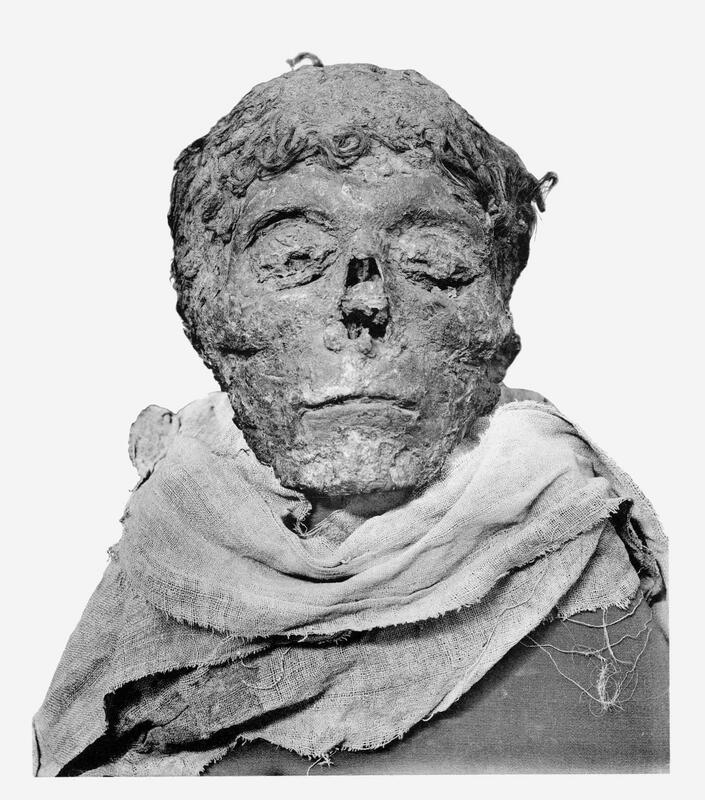 The mummy of one of Seqenenre's sons and successors, Ahmose I (died about 1524 BC), has also been positively identified. Also of interest, but a prince rather than a ruler, is Ranefer, son of the 4th dynasty Pharaoh Sneferu (died around 2589 BC). Ranefer died before his father. Citing Ikram & Dodson, Wikipedia states "Ranefer’s body is the best representation of what mummification techniques entailed during the Old Kingdom." was remarkably preserved. Her skin was soft and moist, with muscles that still allowed for her arms and legs to flex at the joints. All her organs and blood vessels were also intact, with small amounts of Type A blood being found in her veins. There was hair on her head....There was skin on her face, and her eyelashes and nose hair still exist. Narmer's tomb and remains have never been located. The oldest known remains are of Sneferu, from about 2600 BC. The unknown royals in the royal tombs at Ur are not far ahead, dating around 2500 BC. Not the answer you're looking for? Browse other questions tagged ancient-history rulers or ask your own question. Who was the first woman ruler? What is the oldest precisely dated event? What is the most number of brothers who became ruler of the same country? Has an heir ever made the country believe the current ruler died in order to take over the throne? Who was the first female ruler to be given the suffix, “the great”?